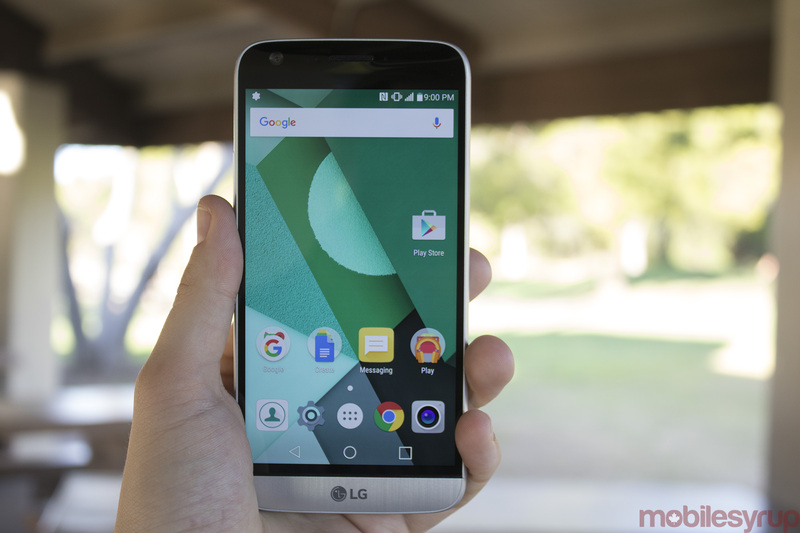 It’s hard not to admire what LG has attempted to accomplish with the G5. In many ways, the company needed to do something big with its latest flagship offering. While the G4 was an impressive upgrade over its immediate predecessor, it failed to gain traction against more compelling offerings from the likes of Apple and Samsung. In the same year the G4 hit the market, Samsung completely revamped its flagship offering with the release of the Galaxy S6, opting for a premium Gorilla Glass 4 body rather than the plastic build of past iterations. 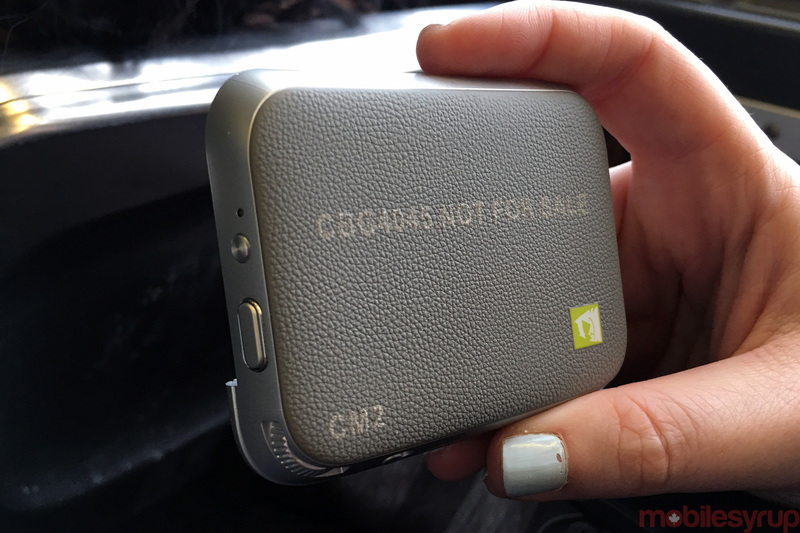 In comparison, the G4’s plastic form factor, though it did feature multiple backings, with one even made of leather, felt dated. When compared to Samsung’s iterative S7 and S7 edge, two devices that look nearly identical to last year’s S6 line, the G5 is a more meaningful upgrade over its predecessor. Unfortunately, to take an analogy from my former life as a video game reviewer, the G5 is the Assassin’s Creed of the handset world, in the same sense that the first entry in Ubisoft’s AC series featured groundbreaking ideas, but didn’t necessarily mesh into a cohesive and enjoyable gameplay experience. With subsequent releases, Ubisoft built on ideas it established with the first entry in the franchise, creating one of the video game industry’s most revered series (at least for the most part). In the case of the modular G5, we’re hoping the features LG is testing with its latest flagship smartphone are an indication of what’s to come from the company. LG’s latest flagship offering is chock-full of innovative ideas, something we rarely see in the modern smartphone world. As a result, it’s easy to get excited this phone. Unfortunately, many of the G5’s marquee features, namely its often-discussed modular port, don’t pan out as hoped – at least not yet. While the G5’s design is generally reminiscent of a Nexus 5X with a metallic body, the subtle bump running the circumference of the phone’s fingerprint scanner – which also acts as the lock and power button – as well as its two front-facing cameras, give off the impression of a device that is unrefined. 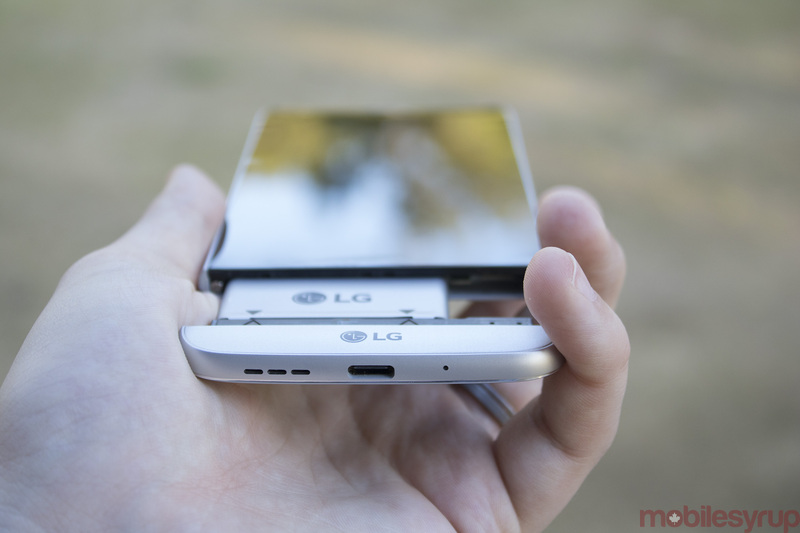 The same can be said about the phone’s subtly curved upper half and smooth indent running around its exterior. It’s difficult to pinpoint, but something feels off about the G5’s overall aesthetic, and I’m not alone in these thoughts. 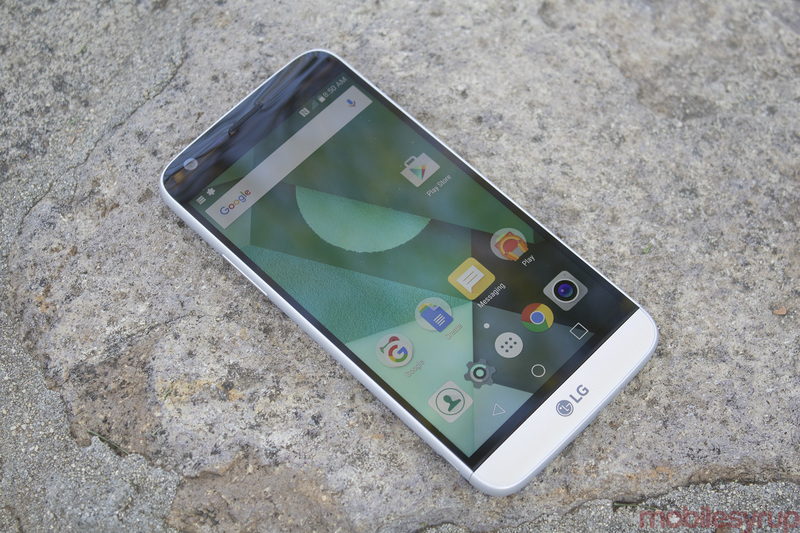 When I showed the smartphone to friends and family members, many remarked that LG’s flagship looked “incomplete.” While this opinion of the phone’s aesthetic ultimately comes down to personal taste, place the G5 beside the iPhone 6s or the Galaxy S7, and most people will come to the same conclusion – it’s not a very good looking smartphone. It’s worth noting, however, that LG’s shift to a metallic body with the G5, is certainly a welcome change for the company. 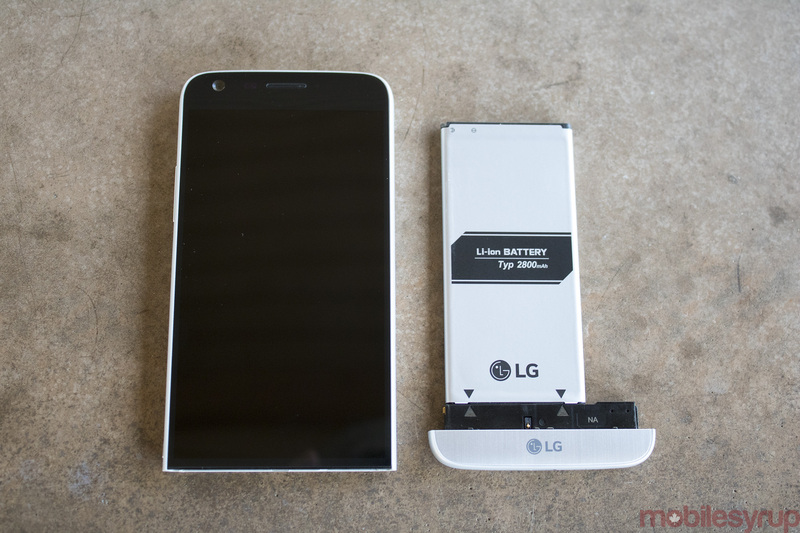 Though, because of its full metal body, the G5 doesn’t support wireless charging. LG has also cleverly hidden the G5’s antenna band inside the device through a new manufacturing technique, something even Apple hasn’t been able to manage with the iPhone. 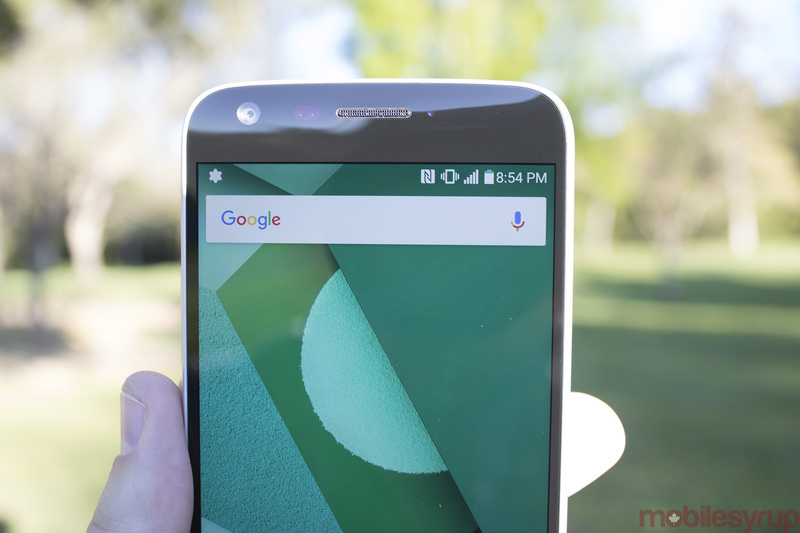 Beyond build, the smartphone’s modular design is the G5’s most significant draw. Current accessories – which LG amusingly calls “Friends” – include the Cam Plus module that turns the smartphone into a point-and-shoot camera, adding a two-stage shutter button, video record switch and zoom wheel, as well as a high-fidelity audio module called the Hi-Fi Plus by Bang & Olufsen. Unfortunately, the only accessory provided to us by LG for this review was the Cam Plus, so we’re unsure how the G5’s Hi-Fi Plus performs, or the company’s future plans for additional modular accessories. While I don’t find either of these accessories particularly useful (I briefly went hands-on with the Hi-Fi Plus at the phone’s reveal in Barcelona), and also question the build quality of the Cam Plus, the G5’s modular port has a significant amount of potential. If third-party accessory manufacturers opt to support the G5’s expansion slot – and the verdict is still out on whether they will or not – this feature could spur a shift in the mobile industry. It’s also a plus that the G5’s battery is removable, a great feature for those who like to carry a spare power-source around, though I question how many people there are out there who still do this. While a lot of early discussion on the G5 will focus, understandably so, on its modular design, it’s this phone’s camera package that will likely create a lasting impression on most people. After using the G5 for a couple of days, I can safely say it will be a shame if more smartphone makers don’t adopt its dual rear-facing camera setup. It starts with the G5’s standard 16-megapixel, f/1.8 camera, which, while not the best shooter I’ve used on a smartphone, is capable of taking excellent looking photos. With both laser autofocus and optical image stabilization on board, pictures turn out crisp and clear, and there’s virtually no delay between hitting the shutter button and the phone snapping a photo. 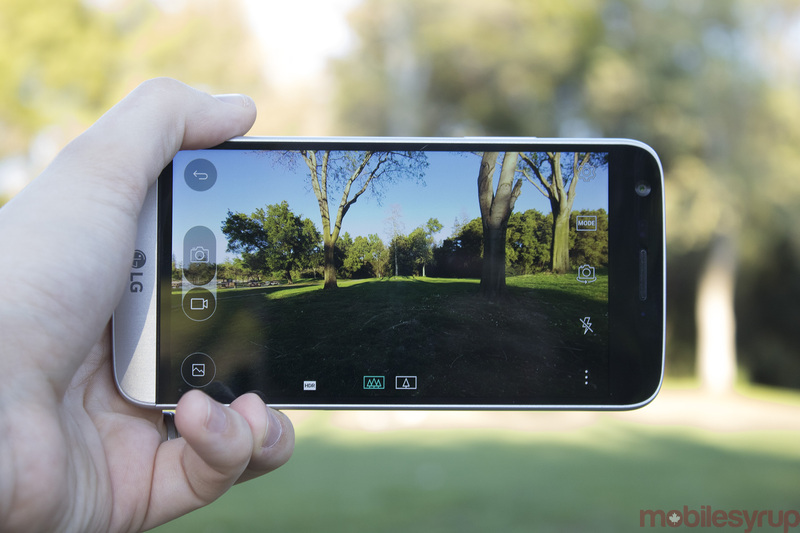 The star of the show, however, is the G5’s second 135-degree wide-angle camera. This 8-megapixel, f/2.4 shooter opens up so many new creative possibilities when shooting an image. With it’s wider outlook on the world, I found this camera encouraged me to think about framing and composition in a way I had never thought of before with a standard smartphone camera. There’s a slight fisheye effect apparent with photos taken with this camera, but, for the most part, the results are great. Special mention must be also given to the LG camera app. 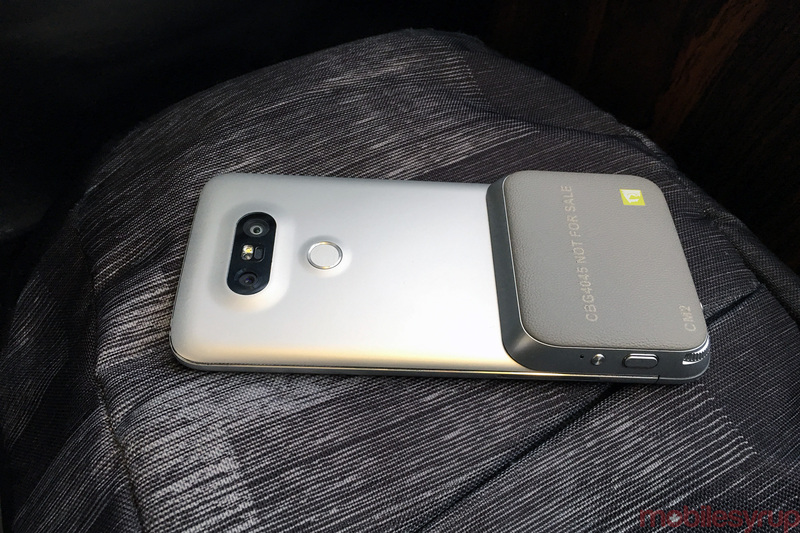 The first time you switch between the G5’s two rear-facing cameras is a wow moment. Thanks to the onboard Snapdragon 820 processor, the transition between the different cameras is nearly seamless. The app also features one of the best manual modes I’ve had the pleasure of using on a phone. Adjusting exposure settings like aperture, shutter speed and ISO is simple and intuitive. Where the G5 trails behinds some other smartphone cameras we’ve seen hit the market recently is in low-light performance. Overall, the G5’s sensor does a decent job of capturing photos where lighting conditions are less than ideal. Partway through the review process, I took several photos during an overcast day in Toronto. In all of the images taken that day digital noise is apparent throughout; it’s even more noticeable in the photos I took with the G5’s wide-angle lens. This is not to say the photos were unusable, but the results were a bit disappointing after playing around with the Galaxy S7, which is exceptional at capturing photos in low light. That said, the creative possibilities the G5’s dual camera setup creates more than makes up for its other short comings. This phone’s camera package will be a revelation to many people, especially for those who have never dabbled in more advanced photography. 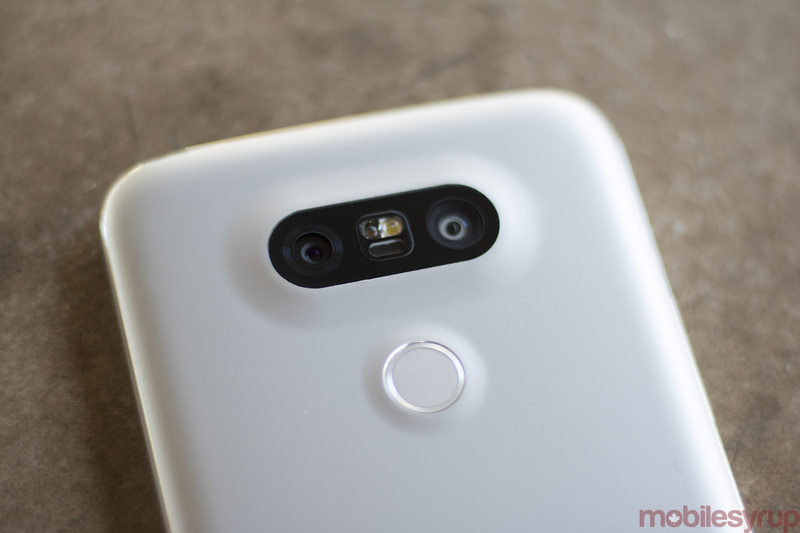 As for the Cam Plus, the camera module LG is launching alongside the G5, it’s less exciting. The issue with it is it never fully commits to giving the user all the controls they need to snap the perfect photo. On even the most entry-level DSLR cameras, separate knobs allow one to adjust settings like aperture, shutter speed and ISO. This is not the case with the Cam Plus. 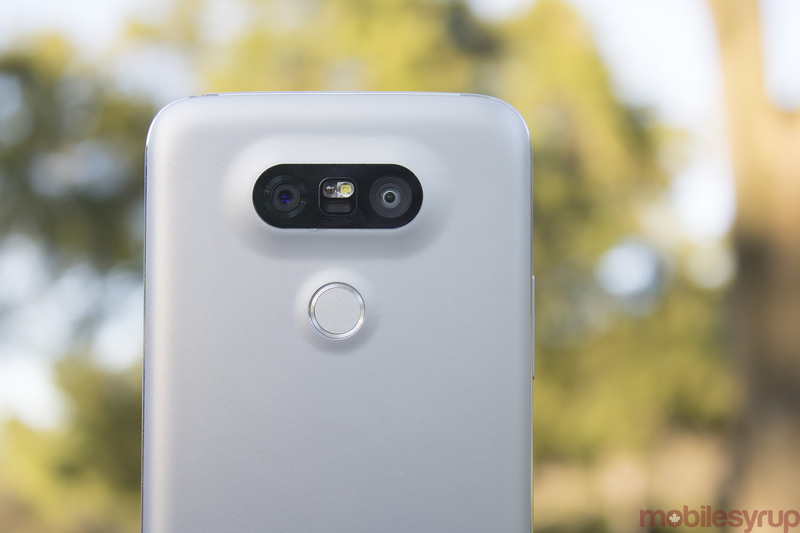 LG could have easily added several more buttons and knobs to its photography-focused G5 module; instead, anyone who buys this accessory will have to settle for a dedicated shutter button, a zoom wheel that allows easy switching between the G5’s two back-facing cameras, and another dedicated button for starting and stopping video recordings. This is fine if all you intend to do is use the G5’s auto camera mode to take photos, but for everything else, including adjusting capture settings like aperture, shutter speed and ISO, you’ll still need to change those options via the phone’s touchscreen. I don’t mean to overstate this point, but it truly is disappointing what a missed opportunity the CAM Plus represents. Ultimately, anyone who buys the G5 will have to ask themselves whether it makes sense to spend $100 on what amounts to a glorified battery pack that happens to have a couple of analog camera controls on the side. As for specs, like most recently released Android devices – notably the Galaxy S7, the G5’s direct 2016 competitor in the high-end Android space – LG’s latest flagship device comes stacked with powerful hardware. The G5 features a vibrant 5.3-inch (down from 5.5 inches in the G4) 2560-1440 pixel QHD display (just above the S7’s 5.1-inch screen in terms of size), 4GB of RAM, 32GB of storage, USB Type-C, Qualcomm’s Snapdragon 820 and a 2800mAh battery. The one downside in terms of the G5 specs surprisingly comes in the software department. The G5’s Android skin, while sleek, can’t match the power of stock Android (not sure power is the right word here), and even lacks the standard app drawer featured in almost every other build. It’s worth pointing out, however, that this issue is easily circumvented by utilizing a different Android Launcher. Furthermore, a recent promotional video released by LG actually seems to feature an app drawer, though its return has not been confirmed by the company. So it’s possible the app drawer could be make a comeback by the time the G5 hits retail. Then there’s the always-on display, which in our tests, seemed to expend the same amount of battery life as the S7’s continuously on screen, amounting to just a few percent per hour. 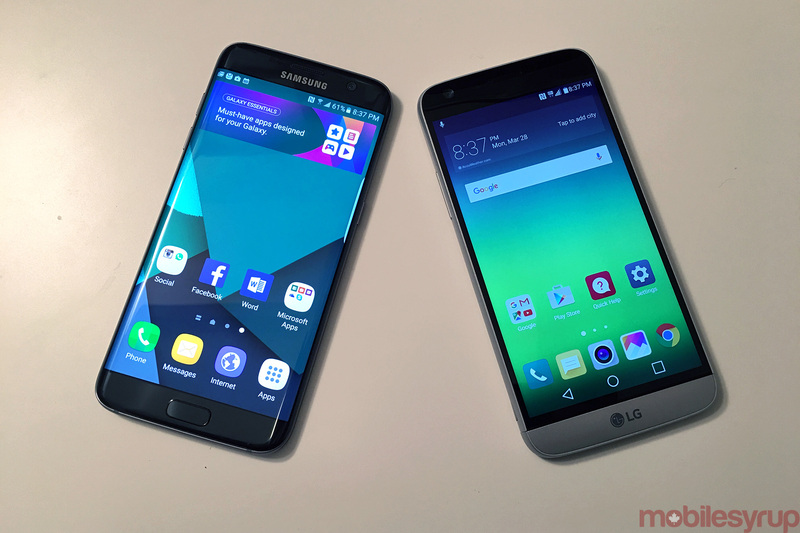 There are, however, a few differences between both flagship’s always-on displays. Unlike the S7’s screen, the G5’s always-on glass is more customizable, allowing notifications from third-party apps like WhatsApp and Gmail. This results in the feature being more useful, though it’s still not very compelling. It’s also worth noting that because the G5’s display is an IPS screen, every pixel needs to be lit up slightly for the always-on display to operate, resulting in it being more noticeable and distracting. This does, however, come with some benefits. Because the G5’s screen utilizes IPS technology, the information present on the always-on display it able remain static, removing the burn in risk stemming from AMOLED screens. 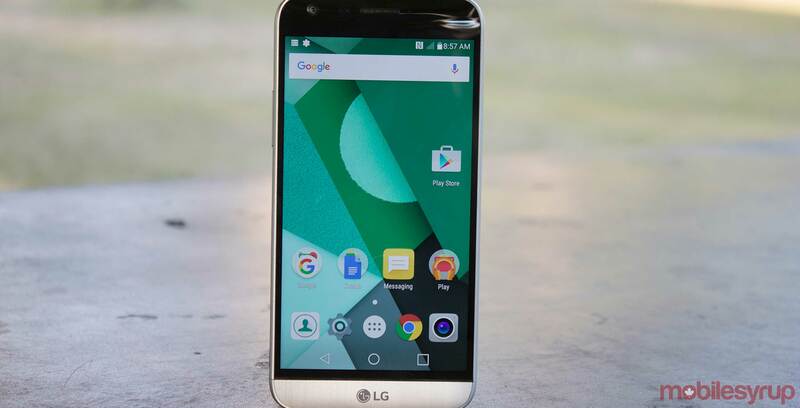 On the hardware side of things, LG’s latest smartphone is an extremely powerful device that’s able to go head-to-head with Samsung’s S7 and even Apple’s iPhone 6s, though our pre-release build of the G5 did suffer from a few software-related crashes. Igor Bonifacic also contributed to this review. Update 04/27/16: After getting our hands on the production model of the G5, we’ve concluded that camera performance is identical to the pre-production unit. The build quality, however, feels slightly improved and more polished, resulting in the retail G5 giving the impression of a higher quality smartphone. Overall we stand by our original impressions of the G5. Update 03/29/16: It looks like the app drawer is making a return in LG G5’s stock user interface dubbed UX 5.0. 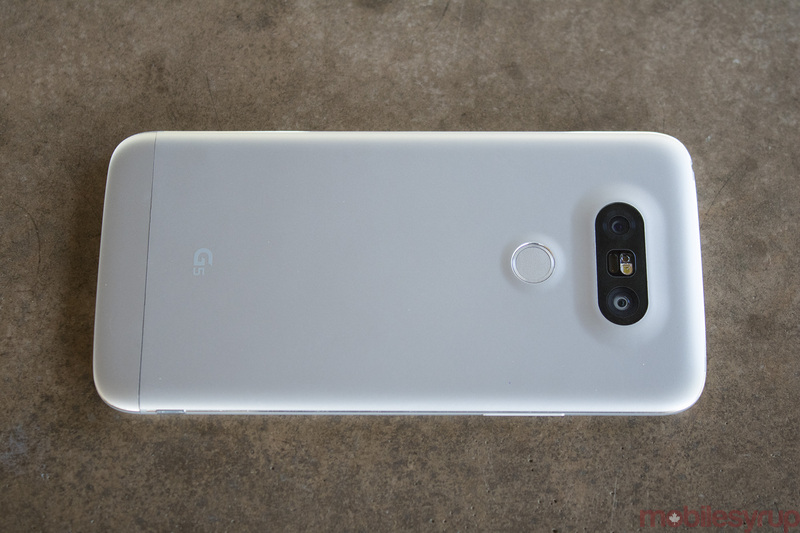 Check out Ted Kristonis’ “six months later” look at the LG G6. So there's a lot to unpack when it comes to the G5 and a number of questions that still need answering. Will more "Friends" accessories be announced, and are third-party manufacturers even interested in releasing accessories for the phone? Also, does the retail release of LG's Android skin really feature an app drawer.It's largely still unclear if LG's modular bet will actually pay off, despite its undeniable cool factor. While it could be a game changer, at launch, LG's "Friends" don't have much to offer. Furthermore, though the G5's second shooter is undeniably compelling, these days a smartphone's aesthetic is often the differentiating purchasing factor for the average consumer, and unfortunately, the G5 is a visual disappointment.All of these factors combine to make the $799 CAD G5 a difficult smartphone to recommend, at least at launch. "It's hard not to admire what LG has attempted to accomplish with the G5"